The World Health Organization (WHO) and the United Nations Children’s Fund (UNICEF) recommend that children initiate breastfeeding within the first hour of birth and be exclusively breastfed for the first six months of life – meaning no other foods or liquids are provided, including water. From the age of 6 months, children should begin eating safe and adequate complementary foods while continuing to breastfeed for up to two years and beyond. [ii],[iii] The early initiation of breastfeeding – putting newborns to the breast within the first hour of life – is critical to newborn survival and to establishing breastfeeding over the long term. 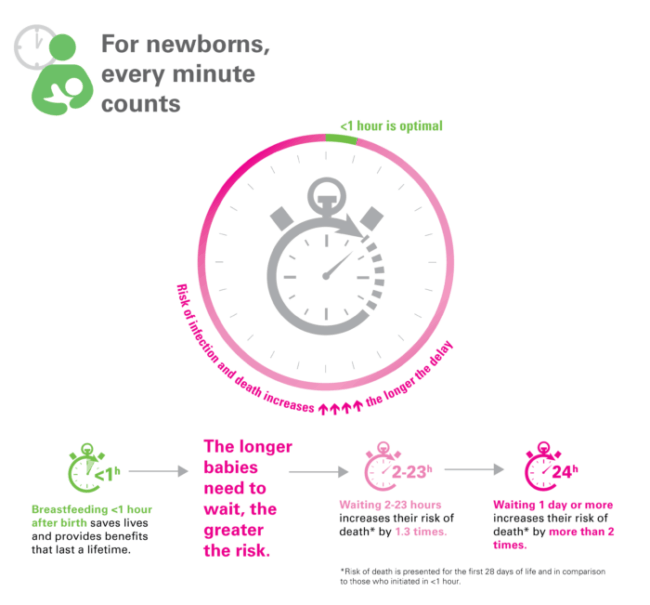 When breastfeeding is delayed after birth, the consequences can be life-threatening – and the longer newborns are left waiting, the greater their risk of death. According to a recent meta-analysis of five studies from four countries, including more than 130,000 breastfed newborns, those who began breastfeeding between 2 and 23 hours after birth had a 33 per cent greater risk of dying compared with those who began breastfeeding within one hour of birth. Among newborns who started breastfeeding 24 hours or more after birth, the risk was more than twice as high. The protective effect of early breastfeeding existed independently of whether or not the children were exclusively breastfed. Source: Smith Emily R, et al. ‘Delayed breastfeeding initiation and infant survival: A systematic review and meta-analysis.’ PLoS ONE, vol, 12, no. 7, 25 July 2017. The report presents analyses of rates of early initiation of breastfeeding for institutional deliveries and caesarean sections, and compares the rates of newborns who received different supplemental foods and liquids in the first three days of life. It also includes country specific data and country examples of successes and challenges, and ends with recommendations. Governments, policy makers and health providers must together do much more to protect, promote and support the early initiation of breastfeeding. By strengthening the capacities of health workers, adopting protective policies and making mothers and newborns a priority, we can capture the moment and give every newborn the best start to life. [i] World Health Organization, United Nations Children’s Fund. Every Newborn: An action plan to end preventable deaths, WHO, Geneva, 2014. [iii] World Health Organization, United Nations Children’s Fund. Global strategy for infant and young child feeding., WHO, Geneva, 2003 <http://apps.who.int/iris/bitstream/10665/42590/1/9241562218.pdf>, accessed 7 March 2018.